Headaches? Foggy thinking? Lethargic? You could be dehydrated. There’s an easy fix for dehydration – drink more water! But remembering to drink more water isn’t always easy – and let’s face it, sometimes water is just plain boring. However, you don’t have to settle for plain water to hydrate yourself. Here are seven tips to help you stay hydrated this summer. Drink at least a couple of glasses of water first thing in the morning rather than having a coffee as you’ve not had any fluids for many hours. However if you just can’t face a big glass of water first thing in the morning, coffee is better than nothing! Keep a jug or bottle of water on your desk. You’re more likely to drink more often if it is within easy reach. Give yourself a goal of finishing the bottle by the end of the day. Or if you’re finding that too easy, refill your bottle in the middle of the day. Keep a bottle of fresh water in your bag. That way when you’re on the go, you can take a swig or two to keep your water levels up. 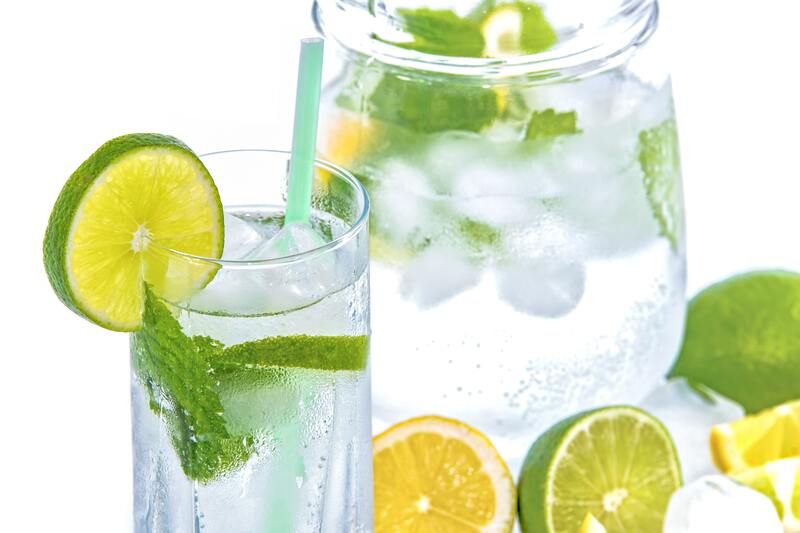 Liven up plain water with a slice of lemon or lime, some juice (no added sugar), or with a little cold tea. This is especially helpful if you just can’t stand drinking plain water. You can even buy an infusion water bottle that will allow you to include your favourite fruits and veggies to flavour your water. Just remember to clean your bottle thoroughly at the end of the day. Freeze pureed fruit (such as peaches or mangoes) in ice cube trays and add a cube or two to plain water. Or if you want to give yourself an icy treat, puree the fruit, add more water and use an iceblock maker to make full size fruit iceblocks. Eat plenty of vegetables and fruit: both have a high water content that will contribute to your daily intake. For example, cucumber is 96% water – plus it adds an excellent refreshing zing if you are inclined to flavour your water. Other fruits and veggies that are high on the hydration list include celery, tomatoes, cauliflower, watermelon, strawberries and broccoli. Drink more liquids. Well it goes without saying. But this includes tea and coffee as well! It was once thought that tea and coffee didn’t count towards fluid intake because, being diuretics, they make you lose more fluid than you take in. Fortunately for tea and coffee lovers, a number of studies have found little truth in this. Tea also has the added advantage of being a useful source of antioxidants. Just don’t go overboard on the caffeine! Staying hydrated can help your energy levels and focus. If you think you might be dehydrated, you can try the pinch test. The elasticity of your skin is an easy way to check your hydration (though not 100 per cent reliable for everyone). Using your index finger and thumb, pinch the skin on the back of your hand and hold for a few seconds. When you let go, if the skin takes a while to return to its normal position, you may be dehydrated.